Saturday September 26th 2015 was a crowded day in the FNC calendar, with three tournaments taking place in three different countries! After a second place finish in 2013 in Cambridge, and a third place in 2014, Brook Roberts finally won his hometown tournament on Saturday. He went unbeaten in qualifications against 19 other players, then defeated Palmer Jack Perkins and Jon Relf 5-0 each. Brook was taken to a tournament-deciding point by Jon Peat in a very close final match, but won 5-4. Dan Wood, the third top 25 player taking part in Cambridge, took third place. Cambridge 2015 was a 300 level tournament, and this win puts Brook back into the top 10 of the FNC current rankings, one place below Jon, currently in 5th place. It also makes the European Masters 2015 qualification situation more interesting, as with one more tournament entry, Brook would be in strong contention for an invite to Berlin in December. 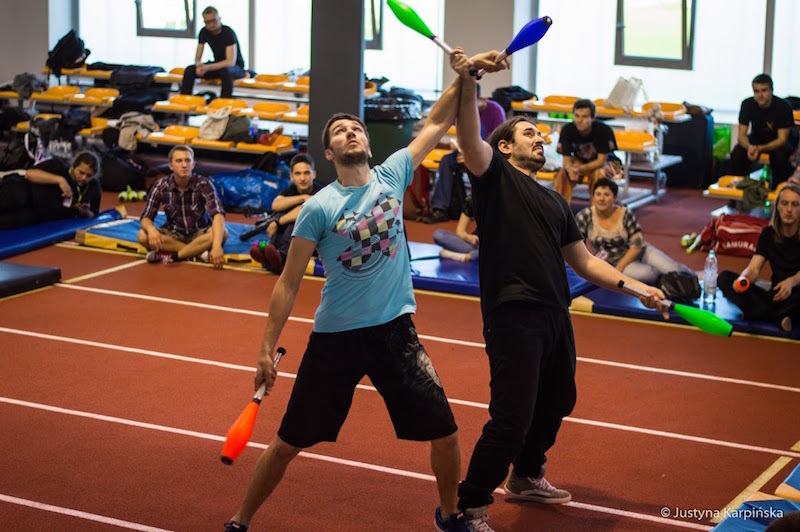 Over in Poland, the Gdyński Weekend Kuglarski 2015 (Gdynia Juggling Weekend) hosted its first FNC tournament. Jakub Szwed backed up his top eight result at the EJC 2015 by beating the next two highest ranked Polish combat players on his way to his first overall tournament win. He took down Artur Perskawiec 4-1 in the semi-final, then trounced Marek "Markian" Żmuda 5-0 in the final. Jakub's Gdynia win brings him 250 rankings points and puts him into the top 20 for the first time. More interestingly it puts him at the provisional 9th place in the European Masters invite list, just two points behind Jochen Hänsel. Can Jakub remain in contention and represent Poland in Berlin? Back in Germany, history was made when Friederike Kraaz became the first ever female juggler to win a Fight Night Combat tournament. She took the title at the Suderburg Jongliernacht 2015 Fight Night, winning 12 of 13 qualification matches to secure the top seed, then lost just three points in her three knockout matches combined. Friederike beat Fabian Fehlhaber 5-2 in the final to secure the 250 rankings points available. She enters the FNC current rankings in joint 38th place. Thanks to Jon Peat, Jerzy Kozłowski and Stephan Cipra for organizing the tournaments this past weekend. Videos and photos from all will be on the way soon. 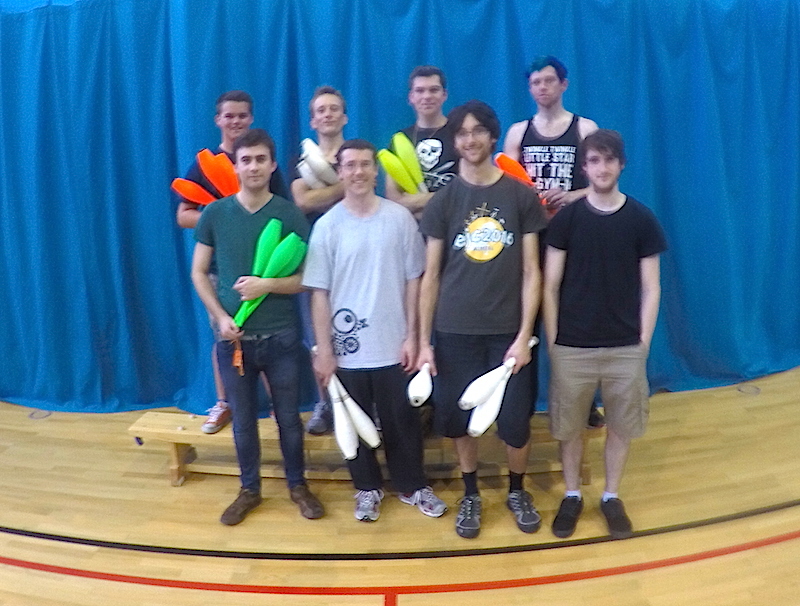 This coming weekend the action continues at the Durham Juggling Convention in the UK. Who knows, maybe Jon Peat will finally win his first 250 level tournament.